On March 24, 2009, in honor of World Water Day, students from six leading Vermont schools brought a breathtaking dance performance, a student's original musical composition, a variety of science projects, creative writings and art, and many other school-led projects--all inspired by water--to the Vermont State House in Montpelier. The well-attended event was held in honor of those schools' commitment to the wise stewardship of water throughout the 2008-2009 school year. The State House participants included students, staff, and teachers from the southernmost Newfane Elementary School, from Lyndon Institute in the Northeast Kingdom, from Randolph Elementary School in the center of the state, and from Lamoille Middle School, Craftsbury Academy and Underhill Central School. All the schools were participants in the Vermont Year of Water and had dedicated that school year to the study of water across the disciplines. Learn more and watch a video on our webpage for the Vermont Year of Water. 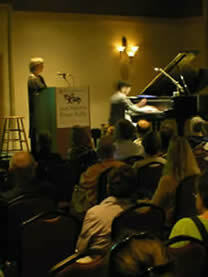 Marjorie participated in April 2008 in three Earth Day concerts with the world-class Portland Symphony Orchestra, in Portland, Maine. The concerts were assembled by guest conductor Ankush Bahl with the assistance and inspiration of the executive director of the symphony, Ari Solotoff. This "History" section of this web page describes some of the other Water Music activities from the past six years. To arrange Water Music concerts, events, lectures or art shows, please write: water05060@gmail.com.